Lofts, by definition, are former commercial spaces that have been converted for residential use and living/work environments. But lofts, by design, are vast silent expanses, soaring arches, stalwart steel girders, massive beams, and all the powerful drama of a curtain-time stage set. Lofts are a designer's dream. The importance of urban loft design for the architectural and design world is highlighted in this collection of the finest, most dramatic of these transformed spaces. Lofts: New Designs for Urban Living takes you on an intimate tour of residential lofts in the major cities of the world including New York, Los Angeles, Sydney, London, Toronto, Paris, and Tokyo. Projects include work from cutting-edge designers: Roto, Fred Fisher, Peter Anders, Neil Frankel, Briggs/Iacucci, Peter Tow, Kar Ho, Moneo/Brock, Belmont Freeman, Lotek, Brayton & Hughes and more. 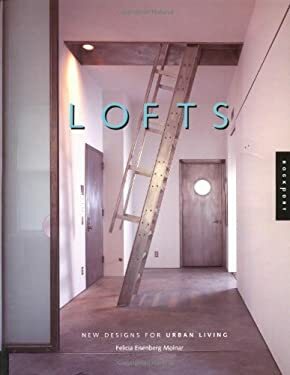 Complete with informative text, Lofts features full-color photographs, plans, and a valuable resource guide for anyone who has every dreamed of converting a commercial building into a residential loft.